An increasingly tech-savvy workforce is changing the future of work and the workplace. The workplace is now where your people are, not where they go – whether that’s the public space of a coffee shop or private space at home. Working hours are no longer standard, dictated by the tasks to be done, not by the clock. Work tools are no longer based only on workplace technology. The same cool features used in consumer devices, such as touch, are now required for workplace devices. It’s this familiar, smart technology that keeps people, across the generations, happy, productive and engaged. 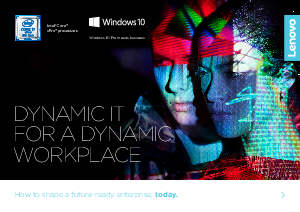 This dynamic IT is the foundation for a smart workplace that will enable you to attract and keep top talent – and shape the future-ready enterprise, now.